At the attack site, 320km northwest of Moscow, investigators found remnants of the bomb, equivalent to 15 pounds of TNT, that left a crater 1.5m deep. 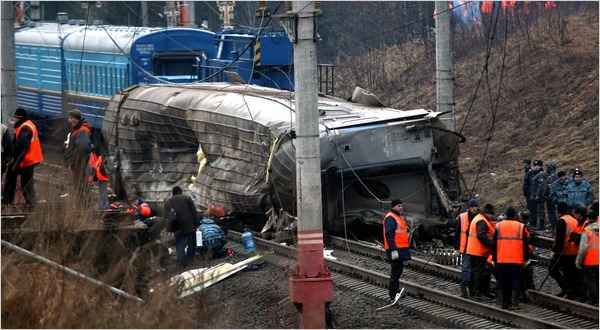 The bomb was apparently planted on the tracks and detonated while the second half of the train was passing. A second, less powerful explosive went off later at the site of the crash. The 1990s were a violent and unstable period in Russia, though the only large-scale terrorist attack was during the 1994-96 First Chechen War -- the 1995 Budyonnovsk hospital hostage crisis, which resulted in 200 deaths. It was Basayev’s first major “success” in as much as it led to peace talks with the Yeltsin’s government and resulted in the establishment of a quasi-independent Chechnya.